Dr Anthony Seymour has run, with friends, to raise money for his son’s special school Wairoa, over the past 6 years. Anthony’s son, James, has autism. He has been at the school since 2007. 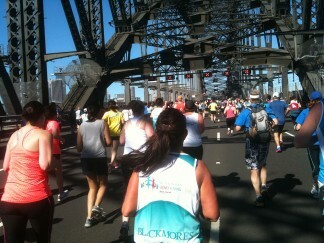 In past years, we have run the Harbour Bridge run (9km), the Bay Run (7km). This year we will do the Harbour Bridge 3.5km Fun Run on Sunday 21/9/2014. Why the “Reader’s Digest” version of the 9km run? As last week’s blog is the story shows that Dr Seymour was not a well man! So for the sake of his health, the 3.5km fun run it is. However, Dave, a friend who ran last year, will do the 9km Harbour Bridge Run. Thanks Dave. If you or your family or friends would like to sponsor us, that would be great. Monies can be sent to school by logging on to the website at https://give.everydayhero.com/au/dr-anthony-seymour . Or come into the surgery and make a donation. We shall let you know how it goes and have some photos for a future newsletter. You can check out http://www.seymourdental.com.au/category/wairoa-special-school-fund-raiser/ for past runs and future updates as blogs on the website. Next week: To HELL and Back – Part 2 – and BACK!